Be just one block away from the Washington State Convention Center! The Paramount Hotel has 144 guest rooms and suites, assuring that each guest gets their attention to detail. It’s perfect for business travelers with their 24-hour Business Kiosk with complimentary services like internet access, computers and a printer. This property is the winner of TripAdvisor’s 2018 Certificate of Excellence and their Asian cafe, Dragonfish, is an award-winning restaurant. Since 2005 the Hotel Max is an oasis for “lovers of music and art”. Art collections are on display throughout the hotel and guest rooms stock up the unique amenity of retro turntables and vinyl. There is even a whole floor in honor of Seattle’s independent record label: Sub Pop Records. 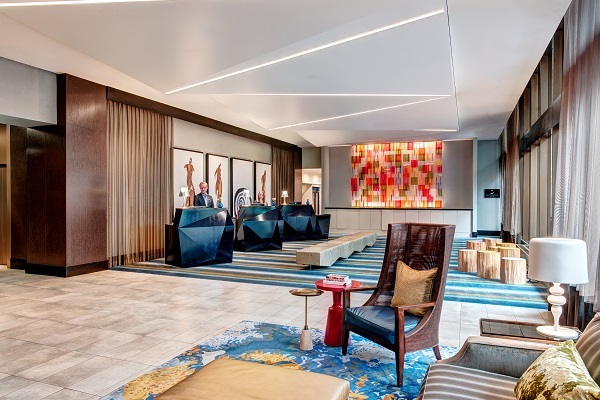 Guests also enjoy the Provenance Signature Amenities which include a locally inspired mini bar, complimentary craft beer happy hour and free coffee and tea every morning in lobby. Parking rate: Valet parking $40 plus tax with unlimited in-and-out privileges. specialty pillows to choose from and Bed linens of 100% Supima cotton percale. The theme of this boutique property is to celebrate the carefully curated instead of mass produced. This covers every aspect of their hospitality including serving local food and displaying local art and artifacts. Here’s yet another winner of the TripAdvisor’s 2018 Certificate of Excellence. This 91 year old property is also awarded the Best Historic Hotel. The Mayflower Park Hotel was built in 1927 and has 160 rooms designed with a Classic/Queen Anne aesthetic. All rooms have a coffee maker, WiFi, luxury robes, mini fridge and more. There is also Mediterranean dining at the Andaluca restaurant and bar. Guest rooms at the Motif Seattle celebrate the colors and natural woods of the Pacific Northwest. Don’t worry about getting caught in the rain, all rooms put out “rainy day outdoor gear” so you can comfortably walk around the city. This boutique property is a AAA Four Diamond rated hotel and the winner of TripAdvisor’s 2018 Certificate of Excellence. Don’t forget to catch stunning views of Seattle at their rooftop lounge. Regional cuisine is served at the Frolik Kitchen + Cocktails. Parking rate: Self-parking garage $45 with in-and-out privileges up to 4 PM on the check-out date. Please note: Expovision is the official APhA Hotel Reservation Office. If you’ve been contacted by a hotel scammer, please report them to aphahotels@expovision.com. Rates are as of 10/31/2018 and are subject to change until booked.